Yosemite Bug Rustic Mountain Resort On Hwy. 140, 26 mi. west of Yosemite Valley, (866) 826-7108, (209) 966-6666. 22 rooms. Some shared baths. No TVs or phones. Restaurant. Hot tub; sauna (fee); health spa. Operating on the site of a former church camp and youth hostel, this lodging is spread out over a hilly site and offers group dorms, private rooms, cabins, and tent cabins. My duplex cabin was comfortable and warm and attractively decorated, but unfortunately the mattress was a memory foam that was way past its prime and had forgotten its job. Plan to arrive in daylight, as the property is quite spread out. It offers trails and a swimming hole, plus a comfortable communal area with a fireplace and also an outside sitting area—all this as well as board games, ping pong, and darts, too! A counter-service cafe prepares simple meals, and live music is presented every weekend. Amtrak and YARTS buses stop here. Consult the website for how to visit this area without driving, using only public transportation. YARTS (877) 989-2787; www.yarts.com. Ride the comfortable YARTS (Yosemite Area Regional Transportation System) bus into Yosemite park. It stops in town at various spots in Mariposa and in Midpines at KOA and Yosemite Bug Resort. Things to do in Yosemite. Bett’s Gold Coin Sports Tavern Hwy. 140/Fifth St., (209) 742-7574. L-D daily. Referred to by locals as “the coin,” this family-friendly watering hole has a large rectangular bar with plenty of seating, a pleasant open-air balcony, and live music on weekends. The building features a brick exterior with iron shutters, and a plastic-covered reveal of the original 160-plus-year-old adobe bricks can be viewed on the way to the restrooms. In the days when the town had at least one murder every day, Fremont used this building as headquarters for mining operations. Nowadays you can get sandwiches, burgers, and full dinners, and even kids are welcome and provided a special menu. Castro Oaks Fine Wine and Art 5022 Hwy. 140, (209) 742-2000. This tasting room provides a free tasting of their hearty Zin and smooth Cab, but you can also purchase wine by the glass and stay a while. Art by locals is displayed and for sale. The Vineyard is located 9 miles away on Highway 49 in Mt Bullion; visits are by appointment. down a pint (and it is the only craft brewery found between Fresno and Yosemite). I favor the German-style Bootjack Blonde. Note that as is often the case in Ireland pubs, no food is served. More things to do in Yosemite area. 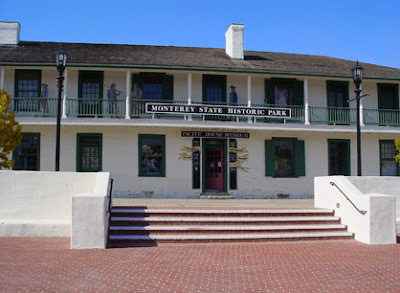 Mariposa Museum and History Center 5119 Jessie St., (209) 966-2924. Daily 10-4. $4, under 18 free. In addition to exhibits curated by topic inside the rustic, woodsy museum--including things like Miwok Indian baskets and an iron so heavy you can barely lift it--you’ll find mining exhibits and a Miwok Indian bark house outside. A guided tour will make sure you see exhibits you might otherwise miss—a broom-making shop, the Gazette newspaper building displaying the original press and print shop, the blacksmith shop, and the still-working 1874 five-stamp mill. The de Young Museum is currently showcasing "DAVID HOCKNEY: A Bigger Exhibition," and what a show it is. Hockney is famous for his paintings on the bottom of L.A. swimming pools, but this show displays his further fascinating talents with synchronized digital videos, iPad painting, and inkjet printers. Water colors, sketch books, and charcoals--which I found kind of boring amid his other vibrantly colored workx--are also in the mix. 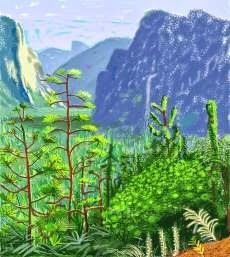 Many depict rural East Yorkshire in England, but a series of vibrant iPad drawings of Yosemite are hung around the walls in one room giving me the feeling of being in that park looking up at the spectacular natural sights. Tickets are timed. You can purchase advance tickets online. Tuesday and Wednesday afternoons are typically the slowest days/times of the week. For day-of ticket purchasing on week days, you should have no problem. On Saturdays and Sundays, come in the morning as tickets tend to sell out by the afternoon. Show runs through January 20, 2014.